Executive Producers and original filmmakers Sam Raimi, Bruce Campbell along with showrunner Craig DiGregorio were joined by cast Lucy Lawless, Ray Santiago, Dana DeLorenzo and Jill Marie Jones for the surprise screening in advance of the October 31st series premiere. Fan reactions to the first episode of the all new STARZ original series captured in special video featurette. New York, NY – October 12, 2015 –Bruce Campbell fans nearly dropped dead when STARZ unveiled a surprise screening of their new original series, “Ash vs Evil Dead,” the long-awaited reprise of the popular Evil Dead films, at New York Comic-Con on Saturday, October 10th. Master fanboy and panel moderator, Kevin Smith was joined by “Ash vs Evil Dead” Executive Producers and original filmmakers Sam Raimi, Bruce Campbell, along with showrunner Craig DiGregorio, and cast in addition to Campbell including Lucy Lawless, Ray Santiago, Dana DeLorenzo and Jill Marie Jones for the priceless moment when fans were finally reacquainted with their favorite anti-hero, Ash Williams. Nearly 2,400 fans were treated to the surprise screening at the Hammerstein Ballroom in New York City. As part of “Ash vs Evil Dead’s” presence at New York Comic-Con, attendees of the Con could also participate in a killer “Ash vs Evil Dead” experience in Ash’s trailer and swag for the bravest souls that dared to enter. “Ash vs Evil Dead” premieres on Saturday, October 31st at 9 PM ET/PT exclusively on STARZ. 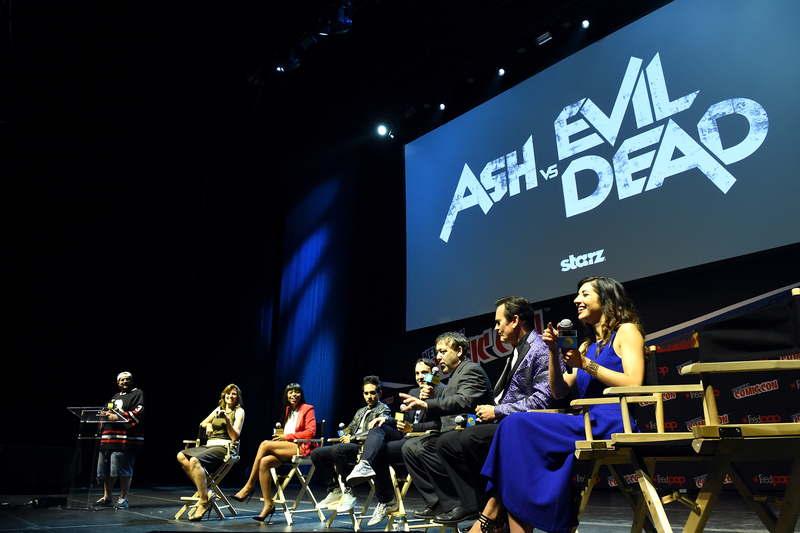 Join the conversation with: #AshvsEvilDead and #STARZ. Previous PostParanormal Activity Team To Be Honored At Screamfest!Next PostNYCC 2015: Daredevil Season Two Trailer!